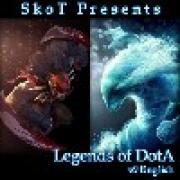 DotA v6.69b LoD v9 EnV 777 is A Custom Version of DotA That Let the Players Can Able to Choose 3 Skills and 1 Ultimate to Combine into 1 Unique Hero in an Epic Battle to Defend the Ancients. -allpick(-ap), -allrandom(-ar), -tripledraft(-td), -singledraft(-sd), -megadraft(-md), -ultradraft(-ud) But -ultradraft(-ud) Doesn't Work Properly But it May in the Future. -deathmatch(-dm), -seeskills(-ss), -awardedskill(-ak), -randomultimate(-ru), -unlimitedlevel(-ul), -antibackdoor(-ab), -easybalance(-eb), -hardbalance(-hb). -duplicatemode(-du), -shuffleplayers(-sp), -samehero(-sh), -allagility(-aa), -allintelligence(-ai), -allstrength(-as), -itemdrop(-id), -easymode(-em), -nopowerups(-np), -supercreeps(-sc), -onlymid(-om), -notop(-nt), -nomid(-nm), -nobot(-nb), -noswap(-ns), -norepick(-nr), -poolingmode(-pm), -observerinfo(-oi), -miniheroes(-mi), -fastrespawn(-fr), -meleeonly(-mo), -rangeonly(-ro), -experimentalrunes(-er). 1. At start you have a few minutes to choose skills. 2. Click the hero whose skill you want. 3. Click the + sign above the skill you want. 4. Check your skills on the multiboard at the top right of the map. 5. Choose 3 standard skills and 1 ultimate skill. 6. After skill picking phase, empty skill slots will receive a random skill. 7. Choose a hero after everyone finished picking skills.